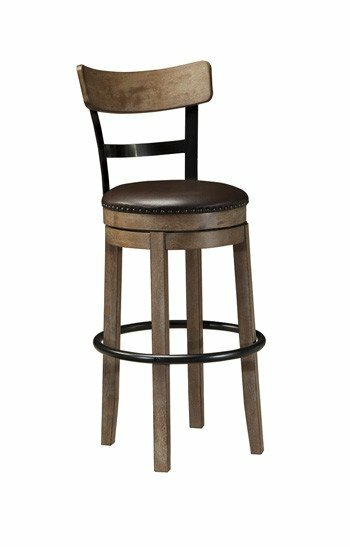 Item Description: Pinnadel pub height bar stool serves a sense of refinement without all the formality. A 360-degree spin element keeps you in the flow of conversation, while faux leather upholstered seating incorporates comfort and easy cleanup. The frame’s signature finish with a wire-brushed effect and gray undertones exudes an easy, relaxed sensibility. Series Features: Tables and some stool accents made with select pine veneers and solids in vintage wire brushed gray brown color. Stool frames made from tubular, stamped sheet and solid bar metal with a gun metal finish. 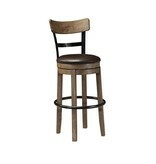 D542-124 and -130 stools have metal frames, wood caprails, wood base with swivel. D542-124, -130 has cushion seat in vintage brown faux leather with nail head trim and metal footrest. D542-224 and -230 stools have metal frames, wood planked seat with adjustable height swivel and metal footrest. D542-024, and -030 stools are made from stamped sheet metal in a retro design with tubular X and stretcher bracing and a convenient handhold cut-out in the seat. D542-024, and -030 have nesting design for compact storage.